Every Protege calendar features 24 stunning photographs by world-class photographers, including David Muench, Marc Muench, Kevin Adams, Derrald Farnsworth-Livingston, Fred Hirschmann, Todd Klassy, Rick Schafer, Mark Lisk, and others. Reaching some of the most scenic and remote areas of each state, the Protege calendars inspire you to experience the beauty and take pride in your favorite state. The calendar also includes a complete moon phase, solstice, and equinox schedule in addition to a year-end planning grid and diverse range of religious, secular, and ethnic holidays celebrated throughout North America. Out on its wide-open prairies, Nebraska still has the feel of the old pioneer days. Its impressive landscape features ponderosa-covered ridges, captivating sandstone bluffs, and calm rivers. All of these places of natural beauty make leaving city life behind very easy. 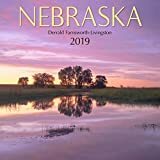 This square wall calendar depicts the remarkable and peaceful beauty of Nebraska. 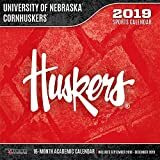 Prove you are a passionate Nebraska Cornhuskers fan with this 12" X 12" academic wall calendar! 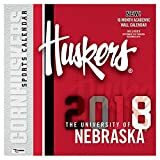 This calendar features 16 months (Sept. 2018 - Dec. 2019) of full-color action shots of the top players from Nebraska athletics, along with player profiles, stadium & mascot images, and visually appealing graphics designed with the school's colors and team logo! Showcase your favorite College/University while keeping track of important dates and busy schedules! Now featuring amazing new graphics to make these a must have for any College/University sports fan!